Mount Cardigan rises up out of the Shem Valley as a beacon for outdoor lovers. Hikers are drawn to its bare summit not only for views but also for the quiet forests that line its approach. Look for salamanders, mushrooms, and blueberries along the way. Waterfalls, a small pond for swimming, and a nature trail await young explorers. Winter adventurers will enjoy the many possibilities for snowshoeing and backcountry skiing. Next to Mount Cardigan State Forest, Cardigan Lodge is located on a 1,200-acre reservation owned by AMC and features a peaceful, roads-end location. Explore our 50 miles of trails, join a family guided exploration, or simply relax on our deck or by the fireplace. If that’s not enough, head to nearby Wellington State Park on Newfound Lake to paddle or enjoy a sandy beach. Cardigan offers a choice of private rooms with private bath, private bunkrooms with shared bath, and individual and group walk-in tentsites. Our High Cabin, just below the Cardigan summit, is great for groups seeking a more remote, backcountry setting. Cardigan Lodge hosts two private lodge rooms with double bed and private bath, as well as 13 lodge bunkrooms with hallway bath (2-, 4-, 5-, and 6-bunk rooms can be reserved as private rooms). Towel and linens are provided during summer full-service season; please bring a sleeping bag and towel during self-service and winter meal service seasons. Dinner, breakfast and a trail lunch are included in the full-service room rate. Friday: Dinner buffet available from 6:00 p.m.-8:00 p.m. Meals available to campsite guests by prior arrangement. Please notify AMC Reservations if you have food allergies or any other dietary restrictions. Put your feet up and enjoy Cardigan Lodge’s comfortable living room with cozy fireplace or enjoy a quiet read in the Library. Relax on our deck and take in the view of Mt. Cardigan’s summit and the nearby swimming pond. Guests can make use of the pack room for storing group gear, as well as the guest refrigerator. A small retail store offers books, maps, logo gear, and last-minute items. Our Demo Center offers guests the opportunity to try out Deuter backpacks and LEKI poles for free. Winter guests can immerse themselves in Cardigan’s ski lodge history and take advantage of the 50 miles of ski trails that criss-cross our 1,200 acres of Lakes Region forest. Our friendly staff is always available to assist with trip planning, weather, and trails information. We are not able to accommodate pets at Cardigan Lodge, the campsites, or High Cabin. Alcoholic beverages are permitted at the lodge, and should be consumed in a responsible manner. 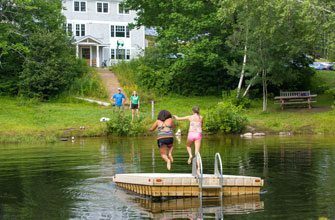 At Cardigan Lodge, in New Hampshire’s Lakes Region, you’ll find your slice of nature, regardless of age or ability. From quiet nature walks to family fun to challenging explorations, Cardigan is the perfect the spot in every season. Hikers of all ages enjoy a hike up Mount Cardigan. The first big mountain hike for many visitors, this 5-mile round trip rewards with inspiring 360-degree views. Located on the eastern shoulder of Mount Cardigan, AMC’s High Cabin offers backcountry solitude with the Lakes Region beauty you crave. Cardigan Lodge offers plenty of options and programs for families to enjoy. Hike, swim in the pond, search for local wildlife, and gather around the campfire for s’mores and stories. The right clothing and gear are essential in the unpredictable weather of the Northeast’s mountains. Even if it feels like summer in the valleys, it can be cold and winter-like on the high peaks. Use our gear guides to make sure you’re packing everything you need for comfort and safety.